To assert that economists are having trouble figuring out the relationship between inflation and unemployment is like saying chefs can’t figure out what to do with salt and pepper. It’s that fundamental. Yet, we’re befuddled, and that has powerful policy implications. For example, a prominent macro economist recently suggested to me that we must have been at full employment for the past 20 years, because inflation has essentially hovered around the Fed’s target of 2% since then (average core PCE, year-over-year, since 1994: 1.7%; standard deviation: 0.4%). If output gaps truly persisted, then inflation should have fallen well below this band; if we were overheated, vice versa. Given the obvious absence of full employment in recent years, I think his point was really that traditional relationships between critical variables are shifting in ways we don’t understand. And given how large this relationship looms both as a policy determinant at the Fed and in understanding the dynamics behind their mandate to balance full employment and price stability, this is a serious problem. I’m thinking about the rest of us, starting at the top—with the Fed—who are struggling to figure out the nature of the tradeoff as the Fed begins to contemplate unwinding. Given Chair Yellen’s (very appropriate) focus on job-market slack and thus her up-weighting of the full employment side of the mandate, there’s clearly some anxiety building around the potential for overshooting on inflation. 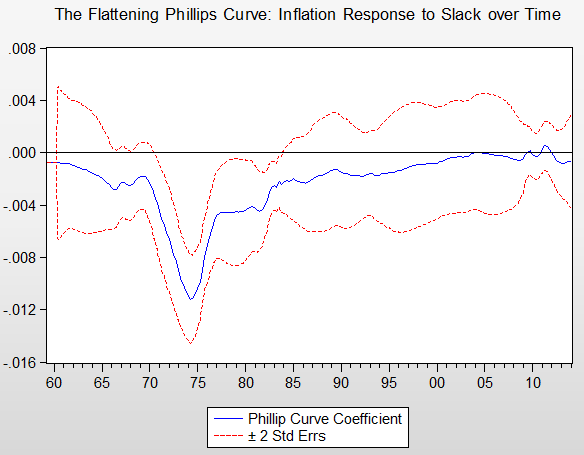 A big part of the problem is the evolution of the inverse relationship between unemployment and price growth, i.e., the flattening of the Phillips curve, implying a reduced negative correlation between inflation and unemployment. This phenomenon is by now fairly well known; the figure below (see here for more explanation) shows how much the correlation has diminished over time. Source: author’s analysis of Ball/Mazumder model. Why has it flattened so much? The Fed has done a good job of convincing people that it will keep inflation “well-anchored” no matter what else is going on, higher inequality means stickier wages, globalization has reduced supply constraints, and especially in recent years, the unemployment rate is widely regarded as an inadequate measure of slack. Of course, one could argue that another implication is that if inflation did start to climb quickly, “flat Phil” also means that it would be harder to slow inflation through higher unemployment. That’s possible, but the above list of “flattening factors” is pointing solidly in the other direction. In fact, I’d say the experience of the 20 years suggests an anti-inflation bias in most advanced economies, with Japan of course leading the pack. To be clear, I think the unemployment/inflation tradeoff lives on—I don’t believe the zero at the end of that Phillips curve figure above. But I’m afraid that’s about the extent of what we know right now. A related problem, noted above, is how to measure slack, the key input into this relationship. Given the decline in the labor force, a phenomenon partly driven by weak demand, the unemployment rate is a less reliable indicator (you’re only counted as unemployed if you’re actively searching for a job). That’s led the Fed to adopt a “dashboard” approach, involving a plethora of indicators, including underemployment, new hires, payroll growth, wage trends, and more. I think that’s both smart and necessary, but it further complicates our understanding of the tradeoff and makes it harder for us to understand what the Fed is up to (remember when they blew by their erstwhile 6.5% unemployment target?). Mericle evaluates the state of the dashboard indicators and finds something quite interesting: the level indicators, like underemployment or the quits rate, are still below their target ranges. But the rate-of-change indicators, like payroll growth, are much closer to the target. By this analysis, there’s still too much slack but it’s closing at a decent clip. How does that map onto inflationary pressures? Who knows?! Next, pretend for a moment that the unemployment rate accurately reflects labor market conditions. 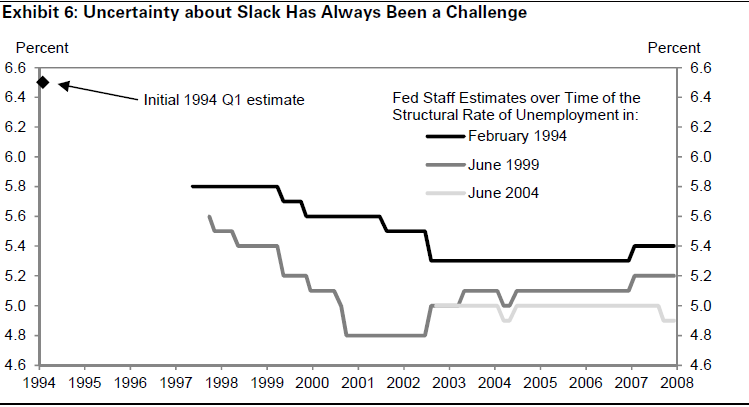 To assess the extent of slack, you still need an estimate of the lowest unemployment rate consistent with stable prices (the so-called “structural rate”). And that number, which changes over time, is elusive to say the least. While economists still crank out such estimates with abandon (even adding numerous decimal points, just to show we’ve got a sense of humor), Dean Baker and I recently pointed out that the confidence interval around these guesses is a whopping four percentage points. Moreover, like I said, it moves. Mericle prints the figure below showing Fed staff estimates of the structural rate over time, from the mid-6’s to the high 4’s. Source: David Mericle, GS Research; Philadelphia Fed. One begins to see how challenging this question of inflation and unemployment has become. The world has changed in ways that both significantly alter this relationship and make it harder to measure. Importantly, those global changes are not random: they lean towards a weaker correlation between slack and price pressures. So what’s the best way forward? First, as the increased analytic scope at the Fed has shown, the simple, two-variable Phillips curve may be a tired, old macroeconomic war horse that should be put out to pasture if not sent to the glue factory. It simply can no longer provide the guidance we need. Second, as I’ve stressed throughout, the history of inflation in recent decades suggests that risk of overshooting is diminished, and even if we do, there’s nothing wrong with slightly higher inflation (there is, of course, a problem with spiraling price growth, but the factors holding down inflation—anchoring by the Fed, global supply chains, restrained wage growth—lower that risk). Conversely, the risk of persistently slack job markets is seen and felt by millions every day, and not just for the millions still unemployed and underemployed, but in the paychecks of the vast majority of the workforce. Simply put, we cannot afford to continue to sacrifice the goal of full employment at the altar of an inflation hawkery that is increasingly out of step with both the data and the changes in the historical relationship between unemployment and price pressures. To their great credit, the Yellen Fed seems to get this, but as time progresses and prices firm—as I said, that correlation isn’t really zero—they’ll be hearing a lot about “overshoot risk.” An honest assessment of what we know should lead them to discount that risk as they keep their eyes on the dashboard and their feet gingerly on the gas. Update: Paul K adds a useful historical perspective and tersely concludes, re tightening timing: “The risks of moving too soon versus too late are not symmetric.” Exactly. Share the post "The Tradeoff between Inflation and Unemployment: What We Don’t Know Can Hurt Us"
8 comments in reply to "The Tradeoff between Inflation and Unemployment: What We Don’t Know Can Hurt Us"
I believe Robert Waldmann is on to something. Your friend Kudlow, CNBC, the Wall Street Journal, Fox News and the rest of the conservative echo chamber have been feeding their elderly, moderately well-off consumers the line these past 5 years that inflation is going to shoot up any day now. This has moderated disinflation and helped the Fed in their inflation targetting. “I give the credit to Fox news. A large fraction of people in the US rely on Fox News (often indirectly as repeated by friends and relatives). They are out of touch with reality — there expectations and perceptions are what Roger Ailes wants them to be. He thinks inflation is bad even though in a depressed economy in the liquidity trap it is good. Therefore Fox News convinces people that inflation has been and will be high. The representative consumer is only partly living in the Fox bubble so perceived and expected inflation are moderate. Then finally actual inflation is low but positive. I’m sure Obama would appreciate the irony. Regarding your link: The author points out that consumers are over-predicting inflation. But what is broken here? Is it the CPI, or is it actual consumers watching their actual food and gas bills actually rising? Do you actually deny the strong debunking of your CPI implication? It is well-known that people take much bigger note of strong rises in inflation than they do when inflation drops or even when prices drop. Food and energy are VOLATILE commodities which fluctuate much more wildly than other prices, so they are observed when they go up and ignored when they hold steady or even decline. The emotional reaction to their volatile moves is not reflective of what is happening in the economy. I suspect that no one commented on your post because they thought it was obvious that you were just being your provocative self, rather than making a meaningful comment (except to innumerates). Just thinking aloud, or in the cloud. I read somewhere an interesting, though troubling, area of research that we may be at a point that we can only have full employment if we have a bubble. Wealth and income have shifted drastically and the great recession has not fixed that. A starving man with no money is considered as having no demand for food. Regardless of how much food could easily be produced, the penniless starve. If the income and wealth become so skewed, the demand for other goods that could easily be produced erodes. It’s the Henry Ford principle. So, are we actually near where our non-bubble economy really is? I don’t believe it’s mismatches of jobs to skills, I think it’s the babysitters coop. But why any inflation? If the average consumer can no longer consume, prices will come down in the short run, but with sticky wages come sticky prices. At some point I cannot sell any lower if I don’t see things turning around. As the economy limps back to life, marginal costs are not linear. I may need to bring an entire line back up to produce one more of a good so I’d better to not. We get raising inflation until enough demand allows me to run that extra shift. If growth stays low, I may never do it. I may be off base, but I think what fixed our economy after the Great Depression was wealth and income redistribution that just so happened to happen because of WWII. At the risk of sounding like an idiot, let me suggest an amateur perspective. Our inflation has generally been caused by comfortable people who knew they were going to get raises… and their shopping in markets where choice was fairly limited. In the past, unemployment tended to involve an erosion of that pool, as relatively comfortable workers (many of them unionized blue collar) lost their jobs. So unemployment cut into inflation. When unemployment went down, lots of people were returning to good jobs and felt reasonably secure in the future. Now, a sharply diminished number of Americans are comfortable and feel confident things are going to get better… and choice has been expanded vastly for most goods, particularly on the internet. In my mind, it makes perfect sense that inflation is going to stay low. Very low as long as internet pricing competition remains high and the number of confident, comfortable employees remains low. The prominent economist has the causation exactly backwards though. And there is a very easy counter-factual to try and find if it is not so: Find a time in history where unemployment went up AND prices went up too. One might be able to find something close in the 70’s but the causation is in the direction of employment changes pushing prices (obviously) so there is some lag to be expected.